Much the way the film, BLACK SWAN, introduced film goers to the world of ballet, a new novel, GIRL THROUGH GLASS (Harper) by Sari Wilson, brings readers to the barre, awakening them to the dark side of beauty in ballet. Natalie Portman won an Academy Award for her portrayal of a ballerina who in the quest for perfection unravels. In GIRL THROUGH GLASS, Mira is an eleven-year-old ballet dancer with big dreams, and parents who are divorcing, during the summer of 1977 in NYC; Kate is a present-day dance instructor at a midwestern college who is having an affair with a student. When Kate receives a letter from a man she thought was dead, it hurls her back into her past. Can either Kate or Mira get beyond the drama to achieve their ambitions? 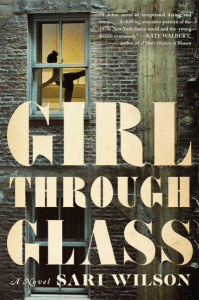 GIRL THROUGH GLASS follows two alternating narratives; Mira’s, which takes readers into the closed cult-like world of ballet and Kate’s story which travels into crime-infested New York City. Over the course of three years, Mira is accepted into the prestigious School of American Ballet, run by the legendary George Balanchine, and eventually becomes one of “Mr. B’s girls”—a dancer chosen for greatness. As she ascends in the ballet world, a shady relationship intensifies, touching dark places within herself and sparking unexpected desires. Being brought into the inner circle of greatness, always comes with a price. Kate’s affair threatens to destroy the career and new life she has created for her reinvented self. Moving between the past and the present, GIRL THROUGH GLASS sheds light on the costs of ambition, perfection, secrets and reveals how the sacrifices we make for an ideal can destroy or save us. I found the technique of alternating narratives, very effective, especially, when the “surprise” is revealed. It’s obvious Ms. Wilson has first-hand experience of her subject matter and is a reliable narrator. I enjoyed GIRL THROUGH GLASS a great deal, but it left me somewhat sad, and at the same time, jealous knowing that there are artists so dedicated to their creations that they will do whatever it takes to accomplish their dreams. Imagine having such tunnel-vision ambition that you’re willing to give up everything and live a conflicted life for that goal? Definitely, not the life choice for everyone. Thus the reason genius is bestowed upon a relatively very few. Sari Wilson trained as a dancer with the Harkness Ballet in New York and was on scholarship at Eliot Feld’s New Ballet School. She was a Wallace Stegner Fellow at Stanford University and a fellow of the Provincetown Fine Arts Center. 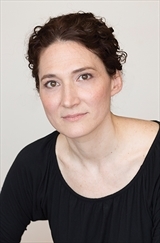 She lives in Brooklyn with her husband, the cartoonist Josh Neufeld. Thanks to TLC Book Tours www.tlcbooktours.com and Harper we have one copy of GIRL THROUGH GLASS to giveaway to one lucky winner – just leave the name of your favorite ballet or dancer and if you’re not familiar with ballet, your favorite Broadway show IN THE COMMENT SECTION ABOVE. We’ll pick a winner Monday. I have always loved The Nutcracker. This #book sounds fascinating! Plus there’s a #giveaway So, I most reblog and share with my followers! Haven’t seen any broadway but would love to. I would love to see the Nutcracker! The book sounds wonderfully intense. I have never seen a Broadway play, but my favorite community play was Annie. My favorite ballet performance is Swan Lake. I would have to say Swan Lake. Thanks for the giveaway. I really like Swan Lake–love the music and the ballet. I had a record of Swan Lake and I’d be doing my homework listening to it. Gives me goosebumps. “Definitely, not the life choice for everyone. Thus the reason genius is bestowed upon a relatively very few.” I agree completely! I like the Nutcracker especially the version they do at Lincoln Center every year. Don’t know a lot about ballet but of the ballet dancers I know, I like Yuan Yuan Tan. She’s of Asian descent and she moves so gracefully she gives me the impression of a swan! I love the Pacific Northwest Ballet out of Seattle, WA. I’ve taken my kids to see a few of their performances over the last few years and they never disappoint.